They blame it on Adam and Eve but no one really knows when exactly we started wearing clothes, but since that day clothing has included everything from a simple cloth tied around the waist to corsets and multiple petticoats covered by an intricate gown. And along the way, we have all developed a few little tricks that make wearing those clothes a little easier and often make you wonder why that never occurred to you before in all these years! Every cowgirl worth her salt knows this trick, and seeing as I’m a cowgirl at heart it didn’t take me long to figure out how to tuck my flare bottom jeans into my boots without getting that stupid bubble that can ruin even the most gorgeous outfit. All you do is fold up the bottoms, then pull the bottom tight against your leg and fold over the extra flap then pull a sock over it and voila – skinny leg jeans! And if at some point you decide that you actually need a new pair of pants, try visiting Target for a wide selection of quality items in a number of styles that will suit you for sure. Boys, this tip doesn’t apply to you, but every girl has had that day when their whole outfit goes out the window because they need to wear a bra, but don’t want the straps to show. This is especially the case with wide neck shirts and dresses. But all you need is a few very thin strips of material and a few sew on press studs and you’ll never have to worry about your underwear showing for all the world to see. There is nothing worse than losing one of your favorite items of clothing to the evil dryer pixies. But with a little time, effort and baby shampoo you can now mount a rescue mission and claim it back! All you need to do is fill a sink or some kind of tub with lukewarm water. Now add the baby shampoo to the water and add the shrunken item. Make sure every fiber gets coated by gently moving the item around. Now remove it from the water and use a towel to get it as dry as possible. Now gently stretch the material back to the original size and leave it laid out on a towel to air dry. Layering clothes is a wonderful technique, and an adorable fitted sweater layered over a button down and a pair of comfy denims (jeans, shorts or even a denim skirt) is one of the best ways to show off your new boots. But sometimes you just can’t get the button down to look good under the sweater no matter how much you tuck, tug or squirm. But that was before some genius invented the tank top! Simply slip a form fitting tank over the button down, slip into the sweater and admire your non frumpy midsection in the mirror! When you get attached to a certain pair of jeans it is very hard to let go of them and even when we’ve out grown them they spend years in the closet, waiting for the day when we’ll fit into them again. But with a little warm water and a half hour of energetic stretching while wearing the still damp jeans you can take them from a tight fit to a comfortable one. I suggest putting the jeans on and climbing into a tub of warm water rather than trying to force yourself into a wet, slightly too small pair. We all have that one T-shirt that we have owned for years, the one that has been washed so many times it is super soft and super comfy. But now you don’t have to wear one shirt for years or wash it a hundred times just to get that baby softness you love. Simply soak your brand new cotton tee in salt water for 3 days, then wash it along with your other clothes. The salt will soften the fibers and that uncomfortable like new stiffness will be gone. 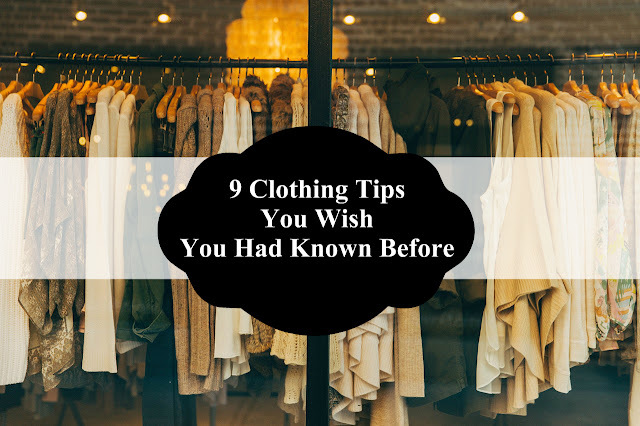 If you have a rule that says you’re never allowed to own more clothes than you have space in your wardrobe for then you’re going to LOVE this tip. And all you need is those little pull tabs from the top of soda cans to do it! Just slide the one hole of the ring tab over the top of a hangar, and then slide a second hangar through the other hole. Now you can plan your matching outfits in advance, or simply double up on your closet space. Plus you get to enjoy a whole lot of soda while you’re doing it! This won’t work on patent leather but if you’re finding that brand new pair of leather shoes, or that beautiful real leather jacket a little too stiff then simply get yourself a little wet to break it in while you’re wearing it. Water is the best way to soften leather and also allow it to stretch and form natural creases that accommodate how your arms or toes bend whether you’re moving around or relaxing. Don’t use any heat while you’re drying it though because this will make the leather almost as hard as plastic! Now doing laundry is not really one of those things that are on your list of fun things to do in a day. And ironing ranks somewhere near if not lower than scrubbing the toilet with a toothbrush! There is no way to avoid doing laundry but you can cut down on how much ironing you have to do if you hang your wet washing with hangers rather than pegs. This is also a great way to save space if your washing line is small. Shake as many of the wrinkles as possible out of the items and hang them so they can go straight from the line to the closet. There are hundreds of other tips that are just as useful so if you're aware of one that we just have to know about then don't hesitate to share it! Ahhh I'm going to try that layering trick soon! I've tried wearing a button down under a sweater many times but never managed to leave the house before changing again because I always look frumpy and boxy with so many shirts on. Also need to try the Jean stretching technique for some of my work pants... half of them I can barely breathe in at this point lol! This is such an awesome list! Actually most of these were new to me, esp. the boots jeans trick and the de-shrinking a shrunken item trick! Thanks for an awesome post! the doubling wardrobe space tip is the one i needed most! thanks Kim! Great post, thanks for the tips!! These are all helpful tips Kim. I never knew about putting socks over those boot cut Jeans to tuck them inside boots. I hate ironing too but I do it because I hate wearing wrinkled clothes. Thanks for these tips. Awesome tips Kim! The amount of items that I have shrunken clothes in the dryer is vast lol! I will def try the baby shampoo tip out, wish I had know about it before as I could have saved so many of my favourite pieces. So many I did not know especially the shrunk dryer one great post. Cannot, will not iron! Loved the tips! awesome tips! I have a lot of bell jeans, so that first one is pure gold to me. I find them all to be very useful, I skiped reading one of them (the one about a dryer) because here we don't really have dryers ( I don't know why but I only saw them in hotels, regular people don't use them in their homes). Even though I hang the clothes wet, I just can't wear some of them without ironing them! Doubling the wardrobe space with tops of soda cans is a great idea, I will definitely give it a try! I love all these tips Kim! I really need to try the undoing the shrinking one! So many shirts off bought and only worn once because they shrunk in the washer! Cool! I didn't know some of these! The way you hang clothes does help with the ironing! Great post with great tips! I've never heard few before! Thanks for sharing! Very helpful and informative tips, especailly the tip about the bra strap showing. Great post! Some really solid tips here! I'll have to put the one about stretching out clothes into play. These are some great tips. I love the ones about the hangers and the bootlegs. Lol! Thanks for sharing, Kim!! Thanks for share your tips Kim! Very useful for me, especially to recover the shrunken clothes and wear jeans and boots. I love the little DIY on how to double your wardrobe. I didn't know that one! These are great tips! What interesting tips. i should save soda tabs! Oh you have given me a great idea Kim, I have a pair of jeans that I might be able to wear if I try your technique. I remember the jeans in the bath tub thing from the 80ies, but never thought of using this tip again.